For every person who loves their high-efficiency washing machine, there seems to be two more wondering how to clean a smelly HE washer. It’s frustrating to spend the extra money on a high-efficiency appliance only to have it stink up your clothes, your laundry room, and eventually your house. 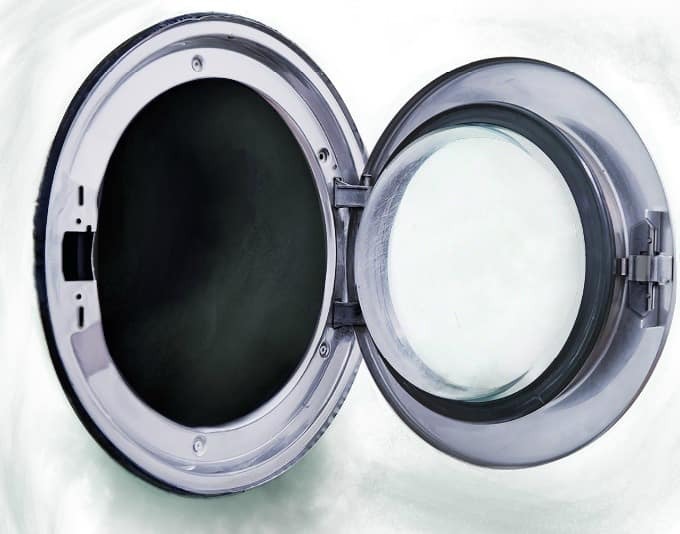 Here’s how to clean a smelly HE washer naturally so you can go back to enjoying yours. 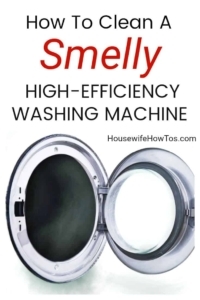 Most times when HE washers develop a musty smell it’s from using too much detergent. The soap leads to build-up which just sits there breeding bacteria. If the door is left closed for too long, mildew sets in, too, and the combination of all that gunk stinks. 1. Tackle the mold and mildew. This is particularly important if you’ve been using cold water in the wash cycle to save money. Cold water doesn’t kill bacteria, so start cleaning your smelly HE washer by washing it by hand using 1/2 cup of bleach added to 2 cups VERY hot water. Dip a cloth in and wipe every surface inside the machine including the glass on the inside of the door. 2. Wipe this well. Put a towel down on the floor in front of the machine, because this next part is messy. Carefully pull the rubber gasket open with your fingers and clean it with bleach water and a fresh cloth. You may need to use an old toothbrush to scrub away any particularly nasty buildup. Get the area between the rubber gasket and the machine very wet and let it sit for 10-15 minutes. Change your bleach solution and, using yet another clean cloth, wipe the inner seal again. Follow with a clean, dry rag. 3. Scrub here. As I mentioned above, sometimes the source of the smell is a detergent buildup. Remove the tray and soak it in hot, soapy water for 30 minutes then scrub well and rinse. Next, wipe it down with bleach solution to kill any lingering spores. Let that air-dry. Before you return the tray, be sure to clean inside the tray compartment with another clean rag and bleach solution. Once the tray is dry return it to the clean chamber. 4. Run a cycle. Add 1/4 cup of bleach to the detergent tray and run the machine on its “clean” setting. (Or whatever yours calls that cycle.) NOTE: make sure your water heater is turned past 120F so the water is actually hot enough to sanitize the machine and its hoses. 5. Wipe it again. Yes, you’ve previously wiped it but the cleaning cycle has probably loosened more crud, so repeat steps 1 and 2. 6. Let it breathe. Leave the door propped open overnight so the machine and its hoses can fully dry out. Give it the sniff test the next morning and, if needed, repeat the cleaning cycle using white vinegar this time. But NEVER mix vinegar and bleach! Make a habit of leaving your machine’s door open so the drum and hoses thoroughly dry out between loads. If that’s not possible due to curious children or pets, you may find yourself needing to make running a hot cycle with bleach part of your weekly cleaning routine.